Oh yes, you’re going DOWN! Hi, I found you via A to Z blog challenge! I picked you out to read because of the name Ophelia London. I'm in the UK, and have free access to Jaffa cakes! It's best not to open a packet. Not unless you want to eat them ALL. I made a giant Jaffa cake once – about 12″ diameter – that was pretty amazing!!! Oh boy. I love sweets and here's something I've never had. Somehow I doubt that I'll find them in rural North Carolina. love this! i miss them, as you don't see them around here as much as hob nobs…thanks for the recipe link! 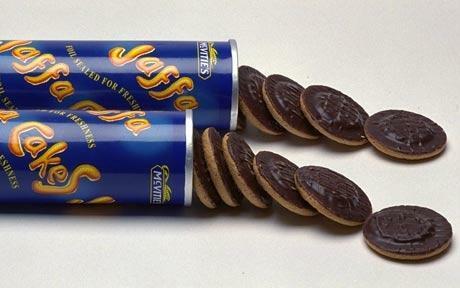 i think I might have to make a special trip to England just so I can stag some authentic jaffa cakes! They sound so incredibly delicious! I love hobnobs too, but I have yet to try the jaffa cakes–this blog was written by my crit partner who is from England. Isn't she mean to not send me any first??? those homemade ones look amazing! the real deal are gooood though (sorry). *Shudder* Jaffa Cakes tear me apart. I was only introduced to them when I moved to England. On the one hand, the texture thoroughly disturbs me… on the other, I have these strange cravings for them even if I don't actually like them. What are they doing to me? Why have people been so selfish with them? I want to cry!!! Haha. Isn't that weird?? I'm the same with pineapple: I CRAVE them, then I'm sick for a day. Jaye (this is Sue), I am ALSO in very rural NC, and I found them in the International section in Harris Teeter. Not sure how close you are to a HT, but it's worth sneaking a peek to see if they have them! Good luck! Will definitely look for these at World Market the next time I get a Munchie bar or TimTam craving. My sis-in-law picked some up for me at the British Emporium in G'vine. One box down….